Many Energy Service Companies or EPC Firms will try to sell your organization specific solutions like solar panels or upgraded HVAC units without taking a larger view of your building. Elements like solar panels alone are not enough to adequately drive down your peak demand charges, lower your energy bills, and get the best performance out of your building’s energy systems. EnergyLink analyzes your entire facility from top to bottom to understand how it works. Then, we create a custom proposal filled with a mix of energy products that would work especially well for your building. All recommendations are made with the intention of delivering the best economic results at financial terms that work for you. Energy projects can be overwhelming with the sheer number of intermediaries that could be involved. In just one project, you could have to work with an: auditing firm, equipment vendor, engineering firm, MEP, general contractor, funding partner, and independent contractor. 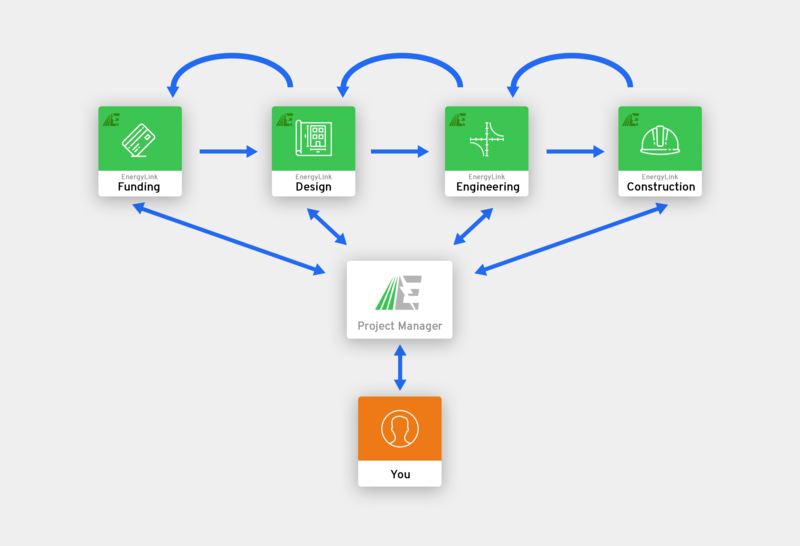 This process can take up to 6 months or more, and, along the way, parts of the project could be value engineered out due to one intermediary being unable to accommodate your requests. EnergyLink handles the entire energy project process for you, so you’re only having to work with us- no intermediaries, no hassle. Our team understands how commercial energy projects work and what’s required to get them done faster. Most projects can be completed in 6-10 weeks or sooner. Our experts combine historic energy usage records from your facility with deep research into the energy market and billing structures, detailed site surveys, and the building operations and schedules. During the research phase, we use the latest technology available to visualize your energy usage in real-time and create an energy usage profile that will be used to build our energy savings algorithms. We use the information from our in-depth research to engineer a wide range of energy efficiency improvements and to tailor our demand response algorithms. Using specialized software, we create, refine, and test proprietary system control hierarchies to mitigate energy demand spikes while preserving overall system efficiency and comfort. These control systems are designed in parallel with on-site generation such as solar power to create our demand management package. “Smart Solar” (solar power linked to automation) is the backbone of our ADMS package. We carefully engineer a solar array based on measured daily load profiles, and current and future energy load estimates. This array drives down the baseline demand of the building at peak times, while our constantly “thinking” automation controls evaluate changing conditions, monitor the solar output, and reduce usage spikes. This dual attack of demand is what makes our solutions unique to the industry and valuable to the end user. Our holistic approach to system design allows us to plan and oversee every step of the product selection, construction, installation, and maintenance process, from the initial survey to the final on-site inspections. Quality assurance during the design phase and quality control during the construction phase is guaranteed by keeping the entire EPC process in-house. EnergyLink also provides continued monitoring and long-term support to ensure that your investment is protected. Contact the experts at EnergyLink to find out more about our innovative process, how we lower your utility costs, and how to get started.